The first selection process will result in a shortlist of forty entrants. These forty entries are listed on this web site and are then reviewed by a number of independent judges who will choose ten finalists between them. 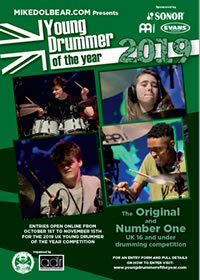 These ten finalists will be notified by telephone and email and are then again listed on the Young Drummer website. Finalists will have to perform a solo piece and two other pieces with a band on the day. One of these pieces of music will be sent to each finalist a few weeks before the finals. The second piece of music will be released on the day of the finals. A five piece kit, hi-hats, 2 crash cymbals, a ride cymbal, stool and hardware will be provided on the day. You may only use your own kick pedal and of course sticks. Music is not about competition. It is a medium which always has and continues to be a means of communication and joy for people the world over. Whether or not you get short listed or even make into the finals, always remember to enjoy making your music and if you don’t achieve what you hoped to this year, with hard work and determination, you may get there next year. Work hard, but most importantly, enjoy it!